Meet Kirsten of Restored Style. Even though her blog is only a few months old (just a baby really), it already has some great posts and how-tos. Naturally I was totally taken with her gray and yellow color scheme for her kitchen remodel but I'll let her tell you all about it. I'm fairly new to the blogging scene, so I was over the moon excited when Stefanie asked me to share a room reveal with you.  I've been a big fan of Stefanie's for some time now and the thought of gracing the "cover" of Brooklyn Limestone is so incredibly exciting! Unlike me, every single room in her house is meticulously crafted and decorated. It has that "finished" feel, you know? Anyway, my husband and I have been slowly restoring and decorating a 1925 bungalow home in Portland, Oregon. Even though we moved in nearly 3 years ago, there are only a few rooms that I consider complete. One of them is our kitchen. Like most remodels, it took much longer than anticipated and we went over budget. It's not my dream kitchen, as I had to choose materials that were within our budget and get creative (we picked up the subway tile from a recycled building materials store), but it's much improved and we love the space. Besides, who can ever really afford their dream kitchen? A few quick things to note...the nook area actually used to be a bedroom. The owners before us took down the wall; however, they left us with some pretty interesting ceiling and wall lines. The goal of the renovation was to connect these two rooms more seamlessly, and also stick with a 1920's period craftsman feel, while modernizing the kitchen and bringing it up to speed with the times (hello ice maker and garbage disposal!). For a full kitchen source list, visit me on over at my blog, Restored Style. I love visitors. Especially new ones! Thanks for letting me share my updated kitchen with you all! Looks great! Love the gray and yellow as well! Beautiful reno! I love what you did, very cool and I would never have thought of putting grey and yellow together....really nice!!! Like yourself, I am new to blogging and have loved Stefanie's style and blog! Good for you for being asked to guest post on her blog, you deserve it!!!! Absolutely gorgeous!!! Love all the pops of yellow! I love, love, love this kitchen!! I have a white painted kitchen, so this is the look I am drawn to. I am not a yellow person, but her bright splashes of it make me want to go buy something yellow! Looks great! A message for Kirsten: your kitchen is adorable and so is your blog. I just bookmarked it. I did spend oodles on a kitchen two years ago and yours is every bit as stylish. Love so many things about this kitchen: cabinets, hardware, lighting, faucet, wood counters, accessories, sigh. Reclaimed Subway tiles! How cool! Your kitchen looks amazing, thanks for sharing, I am feeling really inspired right now. What a great transformation. I love the colors and how neat and organized it looks. You've done an incredible job in changing your kitchen. It's nice to see the color yellow popping back up. Beautifully done. This kitchen is SO gorgeous and relaxing... I wish I was having a mimosa at that bar right now. I am also new to blogging, but I love this blog, and now I will have to check out Restored Style, as I have a 1936 cottage that needs a new kitchen badly. Great job! Absolutely stunning! We did that white "paneling" on my son's bedroom walls. It makes such a difference. Wow! I love all of it! Especially those yellow curtains! What a beautiful remodel, I'm loving those colors too. I love the pops of yellow, especially the curtains and rug! Great job. Great scheme, and the kitchen looks fresh but real and lived in at the same time. Great job! What a beautiful kitchen! I love the subway tile. Thank you all for the wonderful and sweet comments! I'm blushing. Thanks again for this opportunity, Mrs. Limestone. Such a fun visit:). Can you tell me who makes that fantastic yellow fabric? I have a mad crush on it! I WANT IT! I gotta have it!